Light rays are focused on the retina by the structures in the front of the eye such as the cornea and lens. Just as with a camera, the retina is the film that captures light images. 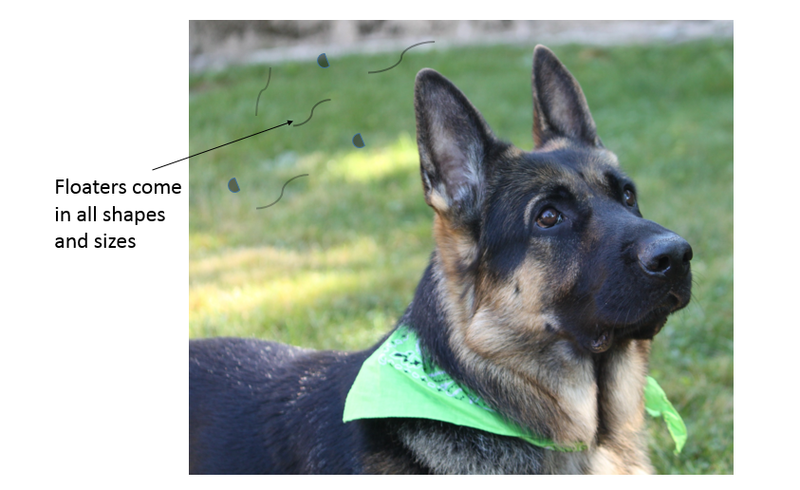 These images are transmitted to the brain through the optic nerve, and this is how we see. 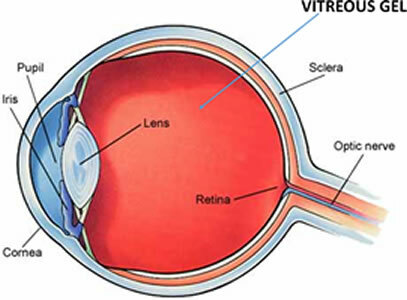 The vitreous is a clear substance that occupies the area between the retina and lens. It has many roles including: maintaining the shape of the eye, acting as a shock absorber, and allowing transmission of light to the retina. The vitreous is made up of water, collagen and hyaluronic acid. When we are young, the vitreous has a consistency similar to jello. As we age, the collagen crosslinks on itself and the vitreous separates from the back of the eye leading to a posterior vitreous detachment (PVD). This normal aging change is similar to how we get wrinkles on our skin. A PVD is a dynamic process that takes about 6 months to complete. In about 90% of the cases, a PVD occurs without problems. In approximately 10% of the cases, a PVD can lead to complications such as vitreous hemorrhage (blood in the vitreous cavity) or a retinal tear that can lead to a retinal detachment. The collagen fibers in the vitreous jelly connect the vitreous to the retina. Some areas, such as the optic disc, fovea and the peripheral retina, are more adherent than others. The separation of the vitreous from areas of the retina is similar to scotch tape on a piece of paper. If the tape is peeled off gently from the paper, the paper is kept intact. If there is a sharp tug, a tear can occur in the paper. If the retina gets torn, a retinal tear occurs. If fluid gets under the retina, it can progress to a retinal detachment. What are the risk factors for a PVD? What are PVD symptoms and treatment? A PVD is painless and symptoms usually include increased floaters and flashes of light. As light casts a shadow on cross-linked collagen, it is seen as floaters. As the vitreous separates, it can also tug on the retina. The retina does not feel pain, but instead you may note a flash of light in your side vision. This is usually seen in dimly lit conditions. If you are experiencing any of these conditions, you should call your eye doctor for further evaluation. The only way to rule out any complications of a PVD such as a retinal tear or detachment is by doing a dilated exam. What can I expect during my examination and follow up? Your eyes will be dilated and a thorough examination of the vitreous and retina will be performed. Special care will be taken to evaluate the peripheral retina for any holes, tears or retinal detachment. A PVD is a slow process that takes about 6 months to complete. As a result, your ophthalmologist will ask you to come back for follow up appointments to ensure that no complications develop. What is the prognosis with a PVD? In most cases, a PVD does not cause any complications. Over time, the symptoms from a PVD subside to the point where most patients are not bothered by them. FLOATERS: Most patients become accustomed to the floaters and only notice them if they look at very bright lights or backgrounds. This may take several months. FLASHES: In most cases, as the vitreous stops tugging on the retina, the flashes tend to subside. This may take several months. What happens if I develop a retinal tear? 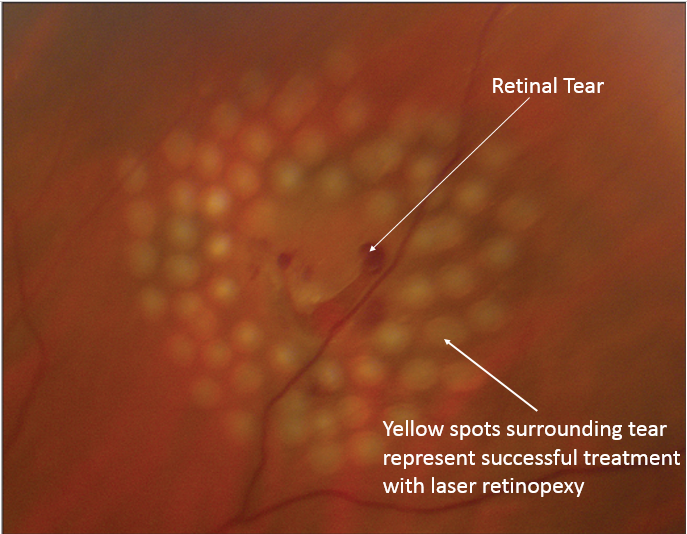 In the early stages, it is possible to treat a retinal tear with laser. This procedure is done in the office. The laser seals off the tear, preventing liquid vitreous from seeping under the retina and causing a retinal detachment. The prognosis after laser treatment of a retinal tear is generally good. Your ophthalmologist will ask you to come for follow up appointments to ensure the retina is healing properly. If not caught early, vitreous fluid seeps under the retinal tear, and lifts the retina from its normal position leading to a retinal detachment. 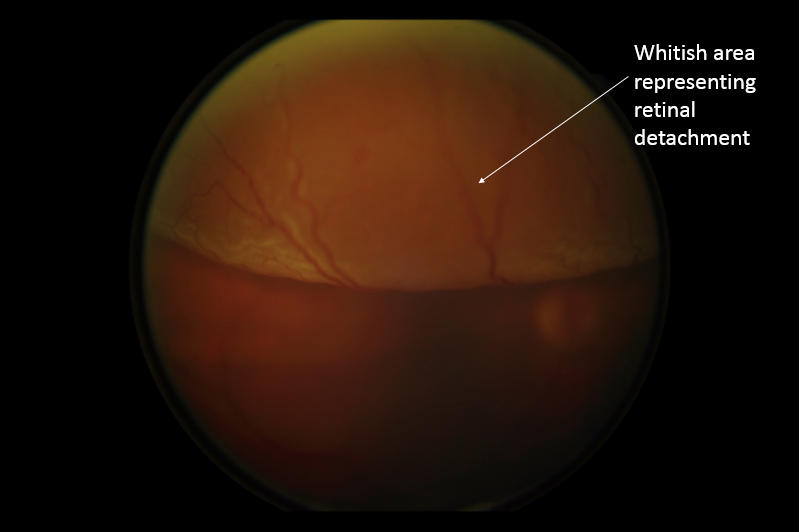 What is a Rhegmatogenous (caused by a PVD) Retinal Detachment? 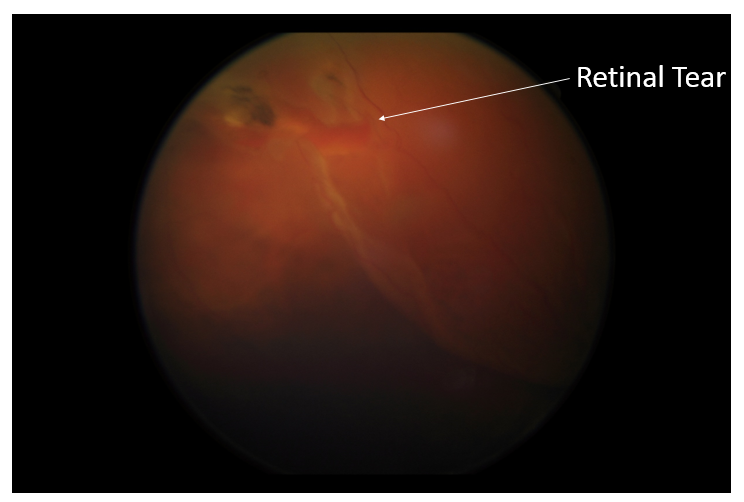 A rhegmatogenous retinal detachment occurs if a PVD causes a retinal tear and vitreous fluid seeps under the tear and lifts the retina from its normal position. Retinal detachments need prompt evaluation as it can lead to permanent visual loss. Symptoms include increased floaters, flashes of light in your side vision, and most important a curtain-like loss of visual field. If you experience any of these symptoms, it is critical to be evaluated quickly by your ophthalmologist. What is my visual prognosis with a retinal detachment? The retina is made up the macular region and the peripheral region. The peripheral retina provides your side vision. The macula is responsible for sharp pinpoint vision that is needed for reading and driving (Video 3.9). Once the retina is detached from its normal position, these areas of the retina can have permanent damage even if the detachment is repaired. 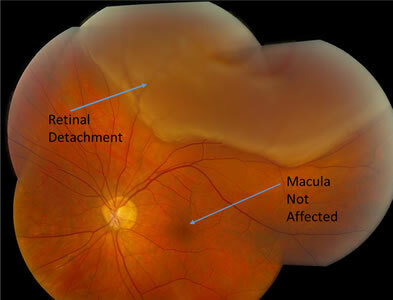 It is important to repair a retinal detachment before the central vision (macula) is affected. The longer a retina is detached, the greater the probability of permanent damage that results in vision loss. Chronic retinal detachments can also have other complications such as scar tissue that can make it more difficult to repair surgically. This can lead to a poorer prognosis and the possibility of multiple surgeries. How is a Retinal Detachment Repaired? There are many factors that go into selecting how a retinal detachment is repaired. Certain small retinal detachments can be repaired in the office using a procedure called pneumatic retinopexy. In the case of more complex retinal detachments, a combination of a vitrectomy and scleral buckle can be done. 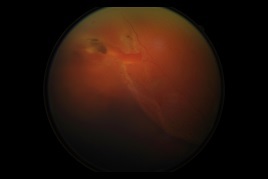 Frequently, in complex retinal detachments, silicone oil is used instead of a long acting gas. The silicone oil can be left in place for several months or in some cases indefinitely. The use of silicone oil requires a second operation to remove the oil. What is the success of retinal detachment surgery? The usual success of retinal detachment repair is over 90%. In a small percentage of patients, despite successful repair, the body develops excessive scar tissue in its effort to heal. This process is called Proliferative VitreoRetinopathy (PVR). PVR is usually an ongoing process and can pull the retina off, making additional surgery to reattach the retina necessary. Your final visual outcome depends on the severity and duration of the initial retinal detachment. Successful repair of a retinal detachment means the retina is anatomically back in its proper position. To get visual improvement, the neural connections within the retina have to be re-established. If this doesn’t happen, then vision is accordingly decreased. Vision can get better up to one year after repairing a retinal detachment.